One of the most enjoyable aspects of living in Aspen is the ease of access to nature. The close proximity also gives many animals easy access to the city. As Aspen dwellers, we must live responsibly in this place in order to facilitate safe urban/wildlife interactions. In September, bear activity goes into hyperdrive. Bears will begin hibernating in late October/early November, so now is their final push to gain as much weight as possible. This time of year, bears feed for up to 20 hours per day, hoping to consume at least 20,000 calories before heading into a hibernation that may last 7 months. In fall, bear encounters in town are not uncommon, especially after a dry winter and summer that yielded low crops of berries and other natural food sources. Bears will eat almost anything, which is why we must be so careful. Obviously, do not feed bears! 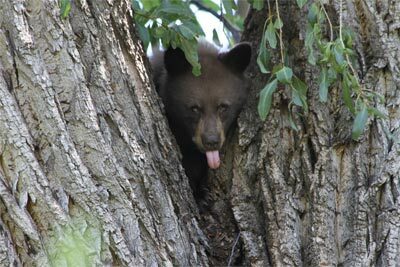 Bears are wild animals, but they will make use of any food source they can find. When bears find an easy food source in town, they quickly become habituated, thus endangering themselves and potentially the community. Bears associating food with humans, trashcans or towns causes the overwhelming majority of conflicts. Please do your part to help!